The Akademik Ioffe is modern, comfortable, safe, and ice strengthened; she was designed specifically to sail with stability in polar regions. A cruising speed of 13.5 knots (14.5 knots in open water) allows more time ashore and more flexibility in changing weather. The Ioffe carries a maximum of just 98 guests – allowing true, small-ship expedition cruising. This is particularly important in Antarctica where restrictions limit the number of passengers landing simultaneously to 100. This maximizes your time ashore since we don’t need timed landing slots. The Ioffe carries a fleet of ten Zodiacs for daily excursions. With both bow and stern thrusters and twin reversible propellers, the ship can spin on its own axis – greatly assisting embarkation of the Zodiacs in windy conditions. All cabins feature outside windows allowing ample natural light to filter in. Cabins all have lower berths (triple share cabins have one upper/lower bunk and port holes). Ship amenities include fitness room, sauna, gift-shop, outside BBQ and observation decks. A dedicated expedition “mud-room” gives you room to prepare for off-ship excursions. A separate lounge and bar, as well as a library provide ideal places to relax or catch up on some reading. A selection of movies and documentaries can also be watched in the lounge. The ship boasts an open-bridge policy. A theatre-style presentation room provides a comfortable place to learn more about the Antarctic during lectures. The sumptuous meals prepared by the culinary team are enjoyed in the dining room, which can sit all passengers at the same time. Triple Shared Cabins Deck 3 cabins feature two lower berths (one that can be converted to a sofa) and one upper berth, ample clothes storage, desk and chair, and two portholes (one opens). Bath facilities are shared but a washbasin is in the cabin. Twin Shared Cabins Deck 3 cabins feature two lower berths (one that can be converted to a sofa), ample clothes storage, desk and chair, and two portholes (one opens). Bath facilities are shared, but a washbasin is in the cabin. Twin Semi-private Cabins Deck 4 cabins feature two lower berths (one that can be converted to a sofa), tall cupboards for clothes storage, desk and chair, bookshelf, and an opening window. Bath facilities are semi-private (shared with the adjacent cabin). Twin Private Cabins Deck 4 and 5 cabins feature private facilities, two lower berths (one that can be converted to a sofa), tall cupboards for clothes storage, desk and chair, bookshelf, and an opening window. Superior Private Cabins Deck 6 cabins feature private bath facilities, two lower berths, a comfortable sofa, a writing desk and chair, plenty of storage space, and several opening portholes. Shackleton Suites Deck 4 and 5 cabins feature two spacious rooms: living area and bedroom with private facilities. The living area is ideal for relaxation with a sofa (convertible to bed), large table, desk, chair, ample storage and a large window that can be opened. The bedroom has a double bed with upgraded linens and pillows. One Ocean Suite Deck 5 cabin has two very spacious rooms: living area and bedroom with private facilities (with a bathtub and shower). The living area is ideal for relaxation with a sofa (convertible to bed), large table, desk, chair, ample storage, large windows overlooking the bow (forward facing) that can be opened. The bedroom features a double bed with upgraded linens and pillows. 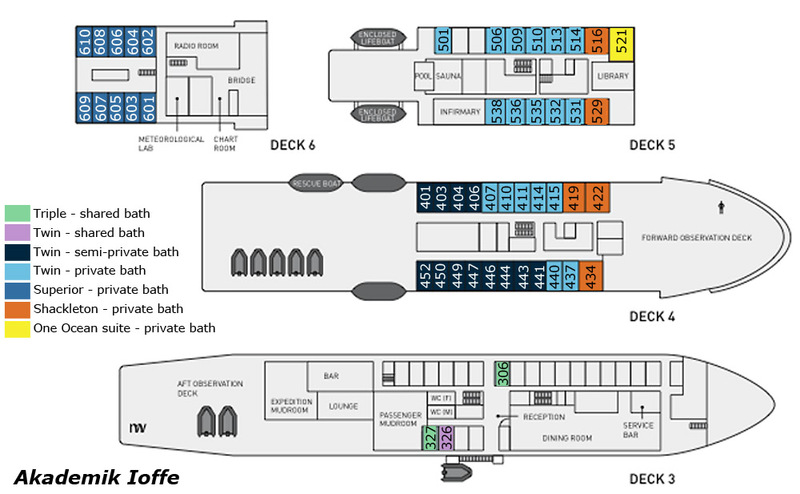 Note: Deck plan, cabin arrangements, and cabin amenities are subject to change by ship operator. Deck plan diagrams are not drawn to scale. The Ioffe carries a maximum of just 98 guests. This is particularly important in Antarctica where restrictions limit the number of passengers landing simultaneously to 100. This maximizes your time ashore since we don’t need timed landing slots.